Managing risk on a frequent basis is the primary function of any commercial companies’ risk or safety manager, but you as their agent have a valuable role in leveraging the risk/safety manager to prevent claims. While there is no doubt having an active risk management/safety plan will impact claims frequency, the better risk plan is built in accordance with industry regulations. Additionally, how does each commercial policy react to a claim? Based on the terms and exclusions, claims can escalate for a heavy equipment operator. Learn how each policy reacts in a claim and best practices to provide your clients with the right solution to give them a fighting chance. Agents can apply these best practices to all of your commercial accounts throughout the policy year. - Learn how to quickly review the risk management plan of your heavy construction clients to determine if they are managing to prevent claims or simply not doing enough. - Review how industry regulations impact risk management, and more importantly; how quickly claims can erode profitability. - Learn from industry experts how to quickly review a safety plan for improvement. 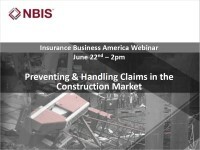 - Discover how claims impact each policy type: commercial general liability, commercial auto liability, commercial inland marine and excess lines. View the on-demand presentation here.